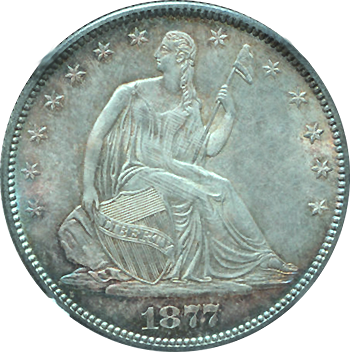 The Liberty Seated Half Dollar was issued between 1839 and 1886 by the United States mint. This coin is 90% silver and the current melt value is $5.42 This coin was in circulation for 57 years. To put this in perspective the Walking Liberty was for 31 years, and the Franklin for just 15 years. 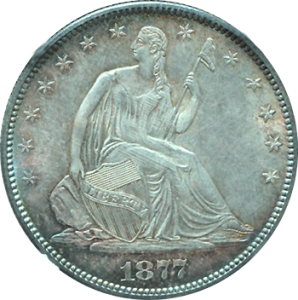 With what is perhaps the longest design use for a half dollar in the United States, the Seated Liberty Half Dollar was in use from 1839 until it was replaced by the Barber Half Dollar in 1892. While the basic design by Christian Gobrecht saw few modifications during this time span, there were changes which led to different weights for the coin, even though the overall diameter and silver content remained constant. While the thickness and the diameter of the coin didn’t change, the weight differences were accounted for by different design features including arrows and rays which means there were actually multiple designs for the Liberty Seated Half Dollar, although the core design remained the same. Due to the exceptionally long production run for the Liberty Seated Half Dollar, there are quite a few readily available on the market. Values for these coins are all over the map with common ones usually running about 1.5 to 2x silver spot value with rare coins in MS conditions capable of running in the hundreds of thousands of dollars. Not only do mint marks and condition make a difference in price but die cracks, design changes such as drapery/no drapery, motto size and the inclusion of arrows and rays will make a difference as well. Any Liberty Seated Half Dollar in MS66 state or better will be well over the $10,000 mark while those in Good condition, with the exception of the rarities, will consistently be in the $30 to $50 range.